For almost twenty years, The Simpsons has been poking fun at American culture. Last Sunday, they satirized three things that are a long time coming: Apple, iPods, and Steve Jobs. To protect themselves from copyrights, The Simpsons called the Apple store a “Mapple store”, substituted “My” for every “i” on the most well-known Apple products, and even had an appearance by Steve Mobs (do I need to explain the joke here?). Since a picture says a thousand words, I definitely invite readers to check out a clip of the episode (“Mypods and Broomsticks”) after the jump. What the clip doesn’t show is when Lisa gets her first MyPod bill that is over $1,000. 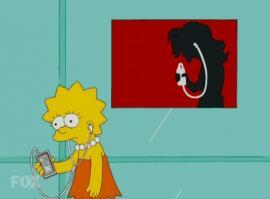 Most of the other jokes from the clip should ring with familiarity with Apple iPod (Mapple Mypod) owners. Also when the Comic-Book Guy runs up to the giant screen of Steve Mobs and hurls a sledgehammer is a clear reference to Apple’s “1984” ad that you can watch here. Granted, the entire episode, which you can view here on Hulu, is not about Mypods, Mapple, or Steve Mobs, as it is more of a secondary plotline. The actual plotline is about Bart making a Muslim friend and Homer suspecting that this new friend’s parents are terrorists. This subtle commentary on post 9/11 intolerance seems a little too late, but their Mapple satire seems timely. Who knows when satirizing Apple will become dated? Who the hell wrote this? “product themselves…”? “poking fun of…”? “ring with familiarity…”? @Colin – Totally agree and now corrected, I think this one skipped the proof reading stage. Thanks for pointing it out and apologies for you having to. ummmmm, it’s a similar plot about terrorists. did they rip it off from american dad’s muslim episode? A topical satire couldn’t possibly cross with another show of the same character, could it?!?? nahhhh. Simpsons did a World of Warcraft show as well. Respect the simpsons for the cornerstone that it is. There would be no South Park, Family Guy (and clone), the Critic, etc., without the Simpsons. Yes, Bart was once “edgy”. 23 years. It’s a legacy. South Park happens to be my favorite (current)show by the way. Simpsons did a World of Warcraft show as well. Respect the simpsons for the cornerstone that it is. There would be no South Park, Family Guy (and clone), the Critic, etc., without the Simpsons.